In a clearing by the creek, located in Kings Plains National Park on the New England Tablelands, pitch your tent for days of bushwalking and relaxation to enjoy this great spot for a family weekend getaway. Set among the rolling farmlands of New England Tablelands, Kings Plains National Park is a destination for the adventurous, independent traveller. Bushwalking along the creek, with its pools and rapids, to Kings Plains Falls is the park’s biggest attraction. Hiking or mountain biking along the park’s 15km of management trails takes you through grassy and shrubby woodlands, and a rare forest of McKies stringybark. Along the way, those into birdwatching and wildlife-spotting will be in for a treat – you can expect to see all sorts of birds and wildlife, from brightly coloured turquoise parrots and crimson rosellas, to eastern grey kangaroos and swamp wallabies. Take a picnic and relax on the edge of one of the waterholes, or pack your camping gear and stay for a couple of days. 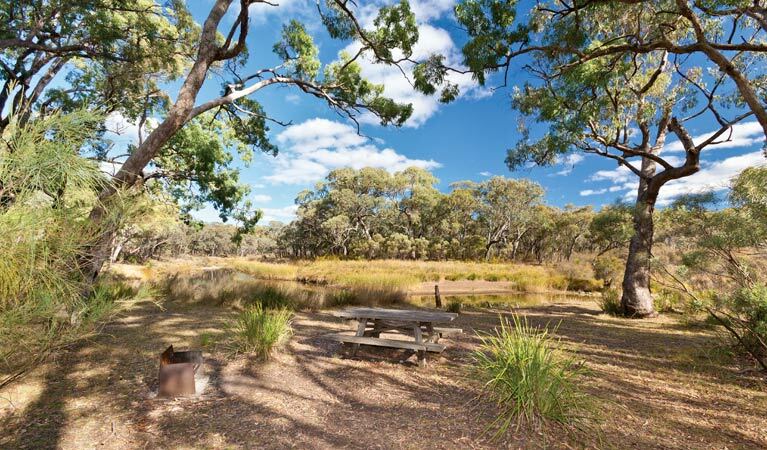 The campground alongside Kings Plains Creek is a peaceful retreat from city life. There are no camping fees charged for Kings Plains campground.